There was still an after-effect, even in Grecian times, of the widespread cultural impulse that was derived from this Asiatic, Luciferic human being. Luciferic wisdom was of the utmost benefit to man in that epoch of evolution — brilliant in a certain way, graduated according to the different peoples and races among which it was spread. It was plainly recognizable throughout the whole of Asia, then in the Egyptian civilization, the Babylonian civilization and even in the culture of Greece. It would, of course, be extraordinarily philistine to wish to say: That was an incarnation of Lucifer, hence we must flee from it! Such philistinism could make one also flee from the beauty and greatness that has come to mankind from this Luciferic stream, for the fruits of Greek culture with all their beauty, proceeded, as already said, from this stream of evolution. The whole of Gnostic thought existing at the time of the Mystery of Golgotha, an impressive wisdom shedding light deep into cosmic realities — this whole Gnostic knowledge was inspired by the impulse coming from Luciferic forces. One must not say that Gnostic thought is therefore false; one is merely characterizing it by saying that it is permeated by Luciferic forces. Then, considerably more than two thousand years after the Luciferic incarnation, came the Mystery of Golgotha. It may be said that the men among whom the impulse of this Mystery spread were still fully imbued in their thinking and feeling with what had come from the impulse of Lucifer. And now there entered into the evolution of civilized humanity an entirely different impulse, the impulse proceeding from the Christ. We have often spoken of what this Christ Impulse signifies within civilized humanity. The Christ-Impulse — I will only touch on this today — was taken up by the hearts and minds that I have just characterized. One might say that it shone into all the best that came to man from Lucifer. And in the first Christian centuries, men understood the Christ through what they had received from Lucifer. These things must be faced without prejudice; otherwise it is not really possible to understand the particular way in which the Christ Impulse was received in the first centuries of our era. As the Luciferic impulse began to fade more and more, men were also increasingly unable to absorb the Christ Impulse in the right way. Consider how much has become materialistic in the course of modern times. But if you ask yourself what in particular has become materialistic, you must receive the answer: a great part of modern Christian theology. For it is simply the starkest materialism to which a great part of modern Christian theology succumbs when it no longer sees the Christ in the man Jesus of Nazareth. It sees only the human being, the ‘simple man of Nazareth,’ the man whom one can understand if one will only raise one’s self a little to some sort of higher understanding. The more the man Jesus of Nazareth could be regarded as an ordinary human being, one belonging to the ranks of other noted human personalities, the better it pleased a certain materialistic trend of modern theology. Of the super-sensible element of the Event of Golgotha, modern theology is willing to recognize little, very little. The impulses entering humanity from a Luciferic source sank down gradually into the soul. On the other hand, however, another impulse, which we call the Ahrimanic, is growing stronger and stronger in modern times. It will become increasingly strong in the near future and on into future ages. The Ahrimanic impulse proceeds from a super-sensible Being different from the Being of Christ or of Lucifer. Equally with ‘super-sensible’ one can say ‘subsensible’ — but that is not the point here. The influence of this Being becomes especially powerful in the Fifth Post-Atlantean Epoch. If we look at the confused conditions of recent years we shall find that men have been brought to such chaotic conditions mainly through the Ahrimanic powers. Just as there was an incarnation of Lucifer at the beginning of the third pre-Christian millennium, as there was the Christ Incarnation at the time of the Mystery of Golgotha, so there will be a Western incarnation of the Ahriman being some little time after our present earthly existence, in fact, in the third post-Christian millennium. To form a right conception of the historical evolution of mankind during approximately 6000 years, one must grasp that at the one pole stands a Luciferic incarnation, in the center, the incarnation of Christ, and at the other pole the Ahrimanic incarnation. Lucifer is the power that stirs up in man all fanatical, all falsely mystical forces, all that physiologically tends to bring the blood into disorder and so lift man above and outside himself. Ahriman is the power that makes man dry, prosaic, philistine — that ossifies him and brings him to the superstition of materialism. And the true nature and being of man is essentially the effort to hold the balance between the powers of Lucifer and Ahriman; the Christ Impulse helps present humanity to establish this equilibrium. Thus these two poles — the Luciferic and the Ahrimanic — are continuously present in man. Viewed historically, we find that the Luciferic preponderated in certain currents of cultural development of the pre-Christian age and continued into the first centuries of our era. On the other hand the Ahrimanic influence has been at work since the middle of the fifteenth century and will increase in strength until an actual incarnation of Ahriman takes place among Western humanity. Now it is characteristic of such things that they are prepared long in advance. Ahrimanic powers prepare the evolution of mankind in such a way that it can fall a prey to Ahriman when he appears in human form within Western civilization — hardly then to be called ‘civilization’ in our sense — as once Lucifer appeared in human form in China, as once Christ appeared in human form in Asia Minor. It is of no avail to give oneself illusions today about these things. Ahriman will appear in human form and the only question is, how he will find humanity prepared. Will his preparations have secured for him as followers the whole of mankind that today calls itself civilized, or will he find a humanity that can offer resistance. It does not help at all to give oneself up to illusions. People nowadays flee the truth, and one cannot give it to them in an unvarnished form because they would ridicule it and scoff and jeer. But if one gives it to them through the “Threefold Social Organism” as one now tries to do, then they will not have it either — not the majority, at any rate. The fact that people reject these things is just one of the means which the Ahrimanic powers can use and which will give Ahriman the greatest possible following when he appears in human form on earth. This disregard of the weightiest truths is precisely what will build Ahriman the best bridge to the success of his incarnation. And nothing will help us to find the right position in regard to the part played by Ahriman in human evolution except an unprejudiced study of the forces through which Ahriman’s influence works, as well as learning to know the forces through which mankind can arm itself against being tempted and led astray. For this reason we will cast a brief glance today at various things which would foster support of Ahriman and which Ahrimanic powers, working out of super-sensible worlds through human minds down here, will particularly employ in order to make his following as numerous as possible. One of the means is this — that it is not realized what is the actual significance for man of certain kinds of thought and conception which predominate in modern times. You know, indeed, what a great difference there is between the way a man felt himself to be within the whole cosmos in the Egyptian age, let us say, and even in the time of Greece, and how he feels since the beginning of the modern age, since the close of the Middle Ages. Picture to yourselves a well-instructed ancient Egyptian. He knew that his body was constituted not merely of the ingredients which exist here on earth and are embodied in the animal kingdom, plant kingdom, mineral kingdom. He knew that the forces which he saw in the stars above, worked into his being as man; he felt himself a member of the whole cosmos. He felt the whole cosmos not only quick with life, but ensouled and imbued with spirit; in his consciousness there lived something of the spiritual beings of the cosmos, of the soul-nature of the cosmos and its life. All this has been lost in the course of later human history. Today man gazes from his earth up to the star-world and to him it is filled with fixed stars, suns, planets, comets, and so on. But with what means does he examine all that looks down to him out of cosmic space? He examines it with mathematics, with the science of mechanics. What lies around the earth is robbed of spirit, robbed of soul, even of life. It is a great mechanism, in fact, only to be grasped by the aid of mathematical, mechanistic laws. With the help of these mathematical, mechanistic laws we grasp it magnificently! A student of spiritual science is undoubtedly just the one to value the achievements of a Galileo, a Kepler, and others, but what penetrates human understanding and consciousness through the tenets of these great spirits in human evolution merely shows the universe as a great mechanism. What this means is only revealed to one who is able to grasp man in his whole nature. It is all very well for astronomers and astro-physicists to present the universe as a mechanism which can be understood and calculated by mathematical formulae. This indeed is what a man will believe in the time from waking in the morning till going to sleep again at night. But in those unconscious depths which he does not reach with his waking consciousness but which yet belong to his existence and in which he lives between going to sleep and waking, something quite different concerning the universe flows into his soul. There lives in the human soul a knowledge which, although unknown to the waking consciousness, is yet present in the depths and moulds the soul — a knowledge of the spirit, of the life of the soul, of the life of the cosmos. And although in his waking consciousness man knows nothing of what goes on there in communion with the spirit, soul and life of the universe while he sleeps — in the soul the things are there; they live within it. And much of the great discord felt by modern man is derived from the disharmony between what the soul experiences and what the waking consciousness acknowledges as its world-conception. And what does the whole spirit and purport of anthroposophical spiritual science say about such things? It says: What the ideas of Galileo, Copernicus, have brought to mankind is grand and mighty, but not an absolute truth, by no means an absolute truth. It is one aspect of the universe, one side from a certain standpoint. It is only through the arrogance of modern man that people say today: “Ptolemaic world-system — childishness; that is what men had when they were still children. We have made such great strides — right ‘to the stars’ and that is what we now take as the absolute.” It is just as little an absolute as the Ptolemaic system was an absolute, it is one aspect. The only right view — according to spiritual science — is to realize that all that is accepted by way of mere world-mathematics, mere world-schematism of a mechanical order, does not furnish man with absolute truth about the universe, but with illusions. The illusions are necessary because mankind goes through varied forms of education in its different stages of evolution. For modern education we need these illusions of a mathematical nature about the universe, we must acquire them, but we must know that they are illusions. And most of all they are illusions when we transpose them into our daily environment, when, in accordance with the atomic or molecular theories, we even endeavour to create a kind of astronomy for the substances of the earth. A right attitude in regard to the whole of modern science, insofar as it thinks along these lines, will recognize that its knowledge is illusion. Now, in order that his incarnation may take the most profitable form, it is of the utmost interest to Ahriman that people should perfect themselves in all our illusory modern science, but without knowing that it is illusion. Ahriman has the greatest possible interest in instructing men in mathematics, but not in instructing them that mathematical-mechanistic concepts of the universe are merely illusions. He is intensely interested in bringing men chemistry, physics, biology and so on, as they are presented today in all their remarkable effects, but he is interested in making men believe that these are absolute truths, not that they are only points of view, like photographs from one side. If you photograph a tree from one side, it can be a correct photograph, yet it does not give a picture of the whole tree. If you photograph it from four sides, you can in any case get an idea of it. To conceal from mankind that in modern intellectual, rationalistic science with its supplement of a superstitious empiricism, one is dealing with a great illusion, a deception — that men should not recognize this is of the greatest possible interest to Ahriman. It would be a triumphant experience for him if the scientific superstition which grips all circles today and by which men even want to organize their social science, should prevail into the third millennium. He would have the greatest success if he could then come as a human being into Western civilization and find the scientific superstition. But I ask you not to draw false conclusions from what I have just said. It would be a false conclusion to avoid the science of the day; that is the very falsest conclusion which could be drawn. We must get to know science; we should get an exact knowledge of all that comes from this direction — but with the full consciousness that we are receiving an illusory aspect, an illusion necessary for our education as men. We do not safeguard ourselves against Ahriman by avoiding modern science, but by learning to know its character. For modern science gives us an external illusion of the universe, and we need this illusion. Do not imagine that we do not need it. We must only fill it in from quite another side with actual reality gained through spiritual research, we must rise from the illusory character to the true reality. You will find reference in many of my lecture-courses to what I am telling you today, and you will see how everywhere it has been sought to enter fully into the science of our time, but to lift it all to the sphere where one can see its real value. You cannot wish to get rid of the rainbow because you know it to be an illusion of light and color! You will not understand it if you do not realize its illusory character. But it is just the same with all that modern science gives you for your imagination of the universe, it gives only illusions and that must be recognized. It is by educating oneself through these illusions that one arrives at the reality. This, then, represents one of the means used by Ahriman to make his incarnation as effective as possible — this keeping of man back in scientific superstition. The second means that he employs is to stir up all the emotions that split men up into small groups — groups that mutually attack one another. You need only look at all the conflicting parties that exist today, and if you are unprejudiced you will recognize that the explanation is not to be found merely in human nature. If men honestly try to explain this so-called World War through human dis-harmonies, they will realize that with what they find in physical humanity they cannot explain it. It is precisely here that “super-sensible” powers, Ahrimanic powers, have been at work. Let us proceed from a very characteristic example. — The modern proletariat has had its Karl Marx. Observe closely how the doctrines of Karl Marx have been spread among the proletariat, with Marxist literature reaching practically immeasurable proportions. You will find all the methods of our present-day science used in the books; everything is strictly proved, so strictly proved that many people, of whom one would never have supposed it, have fallen victim to Marxism. What was the actual destiny of Marxism? It spread at first, as you know, among the proletariat and was firmly rejected by university science. Today there are already a number of university scientists who have veered round to acknowledging Marxist logic. They adhere to it because its literature has proved that its conclusions are in excellent accord, that from the standpoint of modern science Marxism can be quite neatly proved. Middle-class circles have unfortunately had no Karl Marx who could have proved the opposite for them; for just as one can prove the ideological character of right, morality, and so forth, the theory of surplus value and materialistic historical research from the Marxist standpoint, so is it possible to prove their exact opposite. A middle-class, bourgeois-Marx would be fully able to prove the exact opposite by the same strict method. There is no sort of swindle or humbug about it; the proof would work out right. Whence does this come? It comes from the fact that present human thinking, the present intellect, lies in a stratum of being where it does not reach down to realities. One can therefore prove something quite strictly, and also prove its opposite. It is possible today to prove spiritualism on the one hand and materialism on the other. And people may fight against each other from equally good standpoints because present-day intellectualism is in an upper layer of reality and does not go down into the depths of being. And it is the same with party opinions. A man who does not look deeper but simply lets himself be accepted into a certain party-circle — by reason of his education, heredity, circumstances of life and State — quite honestly believes — or so he thinks — in the possibility of proving the tenets of the party into which he has slipped, as he says. And then — then he fights against someone else who has slipped into another party! And the one is just as right as the other. This calls forth chaos and confusion over mankind that will gradually become greater and greater unless men see through it. Ahriman makes use of this confusion in order to prepare the triumph of his incarnation and to drive men with increasing force into what they find so difficult to realize — namely, that by intellectual or modern scientific reasoning today, one can prove anything and equally well prove its opposite. The point is for us to recognize that everything can be proved and for that reason to examine the proofs put forward in science today. It is only in natural science that reality is shown by the facts; in no other field can one consider intellectual proofs valid. 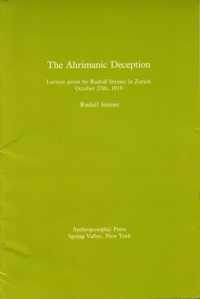 The only way to escape the danger that threatens if one accepts the lures of Ahriman and his desire to drive men deeper and deeper into these things, is to realize through anthroposophical spiritual science that human knowledge must be sought for in a stratum deeper than that in which the validity of our proofs arises. And so, in order to create dissensions, Ahriman also makes use of what develops from the old conditions of heredity which man has really outgrown in the Fifth Post-Atlantean Epoch. The Ahrimanic powers use all that is derived from old circumstances of heredity in order to set men against each other in conflicting groups. All that comes from old differences of family, race, tribe, peoples, is used by Ahriman to create confusion. “Freedom for every nation, even the smallest …” These were fine-sounding words. But the powers hostile to man always use fine words in order to bring confusion and in order to attain the things that Ahriman wishes to attain for his incarnation. If we inquire: Who stirs up nations against each other? Who raises the questions that are directing humanity today? — the answer is: the Ahrimanic deception which plays into human life. And in this field men very easily let themselves be deceived. They are not willing to descend to the lower strata where reality is to be found. For, you see, Ahriman skillfully prepares his goal beforehand; ever since the Reformation and the Renaissance, the economist has been emerging in modern civilization as the representative governing type. That is an actual historical fact. If you go back to ancient times, even to those that I have characterized today as the Luciferic — who were the governing types then? Initiates. 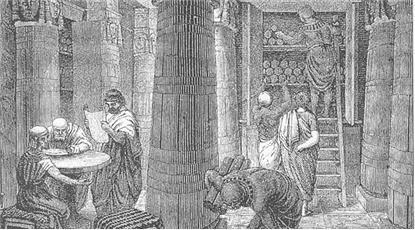 The Egyptian Pharaohs, the Babylonian rulers, the Asiatic rulers — they were initiates. Then the priest-type emerged as ruler and the priest-type was really the ruler right up to the Reformation and the Renaissance. Since that time the economist has been in command. Rulers are in fact merely the handymen, the understrappers of the economists. One must not imagine that the rulers of modern times are anything but the understrappers of the economists. And all that has resulted by way of law and justice — one should only study it carefully — is simply a consequence of what economically oriented men have thought. In the nineteenth century the “economical” man is replaced for the first time by the man thinking in terms of banking, and in the nineteenth century there is created for the first time the organization of finance which swamps every other relationship. One must only be able to look into these things and follow them up empirically and practically. All that I stated in the second public lecture here (The Social Future, October 25, 1919) is profoundly true. One could only wish that it were followed up in all details; it would then be seen how fundamentally true these things are. But just because this rulership of the mere ‘symbol for solid goods’ (that is to say, money — quotation from the lecture) has arisen, Ahriman has been given another essential medium for the deception of mankind. If men do not realize that the rights-state and the organism of the Spirit must be set against the economic order called up through the economists and the banks, then again, through this lack of awareness, Ahriman will find an important instrument for preparing his incarnation. His incarnation is undoubtedly coming, and this lack of insight will enable him to prepare it triumphantly. Such means can be used by Ahriman for a certain type of man. But there is another type — indeed the two are often mixed in one personality — and this also, from a different direction, provides Ahriman with an easy way to success. How numerous are those who think they are speaking out of Christian humility, but in reality out of dreadful arrogance, when they say: “Oh, we need no spiritual science! The homeliness, the simplicity of the Gospels leads us to what men need of the eternal!” A frightful arrogance is expressed, for the most part, in this apparent humility, which can very well be used by Ahriman in the sense I have indicated. For do not forget what I explained at the beginning of today’s lecture, how in the time in which the Gospel falls, men were still permeated by the Luciferic impulse in their thought, feeling and general views, and that they could understand the Gospel by a certain Luciferic Gnosis. But the grasp of the Gospel in this old sense is not possible today. No real understanding of the Christ can be gained if one relies merely on the Gospel, especially in the form in which it has been handed down. There exists nowhere today a less true understanding of Christ than in the various faiths and confessions. The Gospel must be deepened by spiritual science if we wish to gain an actual grasp of the Christ. It is then interesting to examine the separate Gospels and arrive at their real content. To accept the Gospel as it is and as numberless people accept it today, and particularly as it is taught today, is not a path to Christ; it is a path away from Christ. Hence the confessions are moving further and further away from Christ. To what sort of Christ-conception does a man come who will accept the Gospel and only the Gospel, without the depth given by spiritual science? He comes ultimately to a Christ — but that is the utmost that he can reach through the Gospel alone. It is not a reality of the Christ, for today only spiritual science can lead to that. What the Gospel leads to is an hallucination of the Christ, a real inner picture or vision, yet only a picture. The Gospel today provides the way to come to a vision of the Christ, but not to the reality of Christ. That is just the reason why modern theology has become so materialistic. Theological commentators and expounders of the Gospel have asked themselves: What is to be made of the Gospel? They decide at length that in their view the result is similar to what one gets when one examines the case of Paul before Damascus. And then these theologians, who are supposed to confirm Christianity, but who really undermine it, say: Paul was simply ill, suffering from nerves and he had a vision before Damascus. Many people have felt something of this sort. But there is not yet courage everywhere to come to an understanding with the historical impulses of the Christ, Lucifer and Ahriman in the urgent way that is necessary and that is emphasized by Anthroposophy. Even those who have an idea of what is necessary will not go far enough. For instance, look at examples where there arises some knowledge that the secular materialistic science with this Ahrimanic character must be permeated with the Christ Impulse, and how, on the other hand, the Gospel must be illuminated through the explanations of spiritual science. Consider how many people struggle to the point of really shedding light in either of these directions by means of spiritual-scientific knowledge! Yet humanity will only acquire the right attitude to the earthly incarnation of Ahriman if it sees through these things and has the courage, will and energy to illumine both secular science and the Gospel by the Spirit. Otherwise the result is always superficialities. Think, for example, of how Cardinal Newman — who, after all, was an enlightened man, one who followed modern religious development — at the time of his investiture as Cardinal in Rome stated openly in his address that if the Christian Catholic teaching was to survive, a new revelation was necessary. We have no need, however, of a new revelation; the time of revelations in the old sense is over. We need a new science, one that is illumined by the Spirit. But men must have the courage for such a new science. We must see through such things as these today. Purely mundane science would make men entirely subject to illusion; in fact ultimately they would commit only follies. Quite enough folly is perpetuated today already, for surely the World War catastrophe was a great folly! Yet many people were involved in it who were thoroughly saturated with the official secular science of our time. And if you notice what remarkable psychological phenomena at once crop up when some sect or other places one of the four Gospels in the foreground, then you will more easily understand what I have been saying about the Gospels today. See how strongly inclined to all sorts of hallucinations are sects that pay heed solely to the Gospel of St. John, or solely the Gospel of St. Luke! Fortunately there are four Gospels, which outwardly contradict one another, and this has so far prevented the great harm which such one-sidedness would cause. By being faced with four Gospels people do not go too far in the direction of the one, but have the others beside it. One Gospel is read aloud on one Sunday and another on another Sunday and so the illusory power of the one is counterbalanced by that of another. A great wisdom lies in the fact that these four Gospels have come down to the civilized world. In this way man is protected from being caught up by some one stream, which will take possession of him — as in the case of so many members of sects — if he is influenced by one Gospel alone. When solely one Gospel works upon him it is particularly clear how this leads at last to hallucination. In fact, it is essential today to give up much of one’s subjective inclination, much of what one is attached to and thinks pious or clever. Mankind must above all seek universality and the courage to look at things from all sides.